Brief facts of the case are that the petitioners are contract employees of the Federal Govt Educational Institutions (Cantt/Garrison) Directorate. They have been working on their respective posts for the last more than eight years. In 2013, Federal Govt decided to regularize the employees on the basis of policy/criteria for regularization. 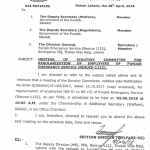 According to the said policy names of the employees were sent to the Cabinet Sub Committee and the committee had to decide about the regularization of employees. Admittedly the names of the petitioners were sent to the committee and committee had approved their names for regularization of their services, but they were not regularized. The petitioners therefore filed the present writ petition. Learned Counsel for the respondents admitted the facts regarding regularization of the petitioners by the Cabinet Sub Committee; it was however added that the total number of employees who were to be regularized, were 1237. 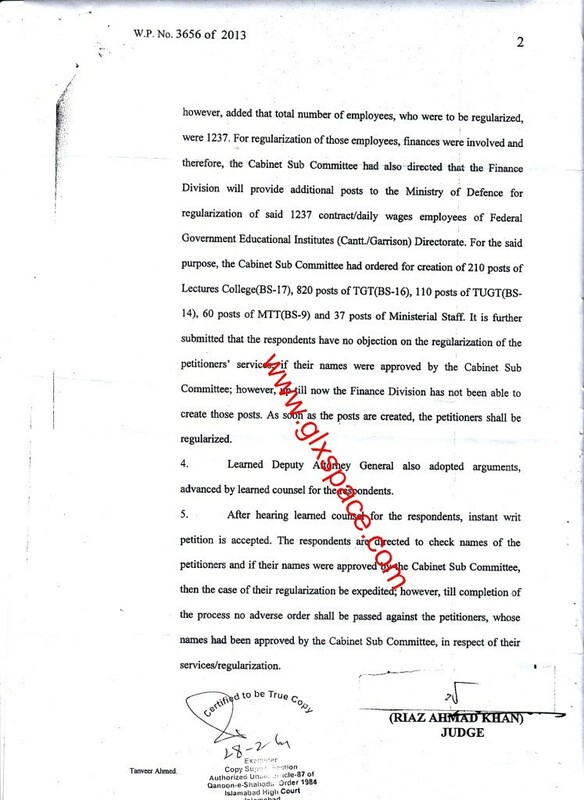 For regularization of those employees finances were involved and therefore the Cabinet Sub Committee had also directed that the Finance Division will provide additional posts to the Ministry of Defence for regularization of said 1237 contract/daily wages employees of FGEIs (C/G) Directorate. 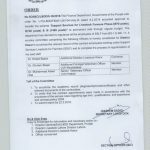 For the said purpose, the Cabinet Sub Committee had ordered for creation of 210 posts of Lectures Colleges (BPS-17), 820 posts of TGTs (BPS-16), 110 posts of TUGTs (BPS-14), 60 posts of MTTs (BPS-09) and 37 posts of ministerial staff. 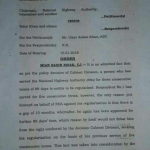 It is further submitted that the respondents have no objection on the regularization of the petitioner’s services, if their names were approved by the Cabinet Sub Committee. However up till now the Finance Division has not been able to create these posts. As soon as the posts are created the petitioners shall be regularized. Learned Deputy Attorney General also adopted arguments, advanced by learned counsel for the respondents. After hearing leaned counsel for the respondents, instant writ petition is accepted. The respondents are directed to check names of the petitioners and if their names were approved by the Cabinet Sub Committee, then the case of their regularization be expedited. However till the completion of the process no adverse orders shall be passed against the petitioners, whose names had been approved by the Cabinet Sub Committee, in respect of their services/regularization. can someone tell about the list of 1237 employees those to regularize? Plz verify if some one knows. 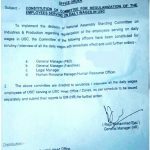 Received a msg saying that IHC has called secrtry Est & cabinet Div for submission of their replies in our case ..
Miss what is the news about the regularization of contract employees of our setup? can we hope for their best future? If you have any news regarding their regularization then share it as soon as possible, please. Dear mujahid mumtaz still no updates. As Research Officer ME Cell MoD , my approximate 5 years terminated on 30th June 2011. My CRP in SC was dismissed by CJ Justice Khwaja on 24th Aug 2015 , On that Day I had strong evidence / proof that a Punjab domicile , Rtd Airforce person Muhammad Ali Khan had been appointed in June 2015 . But JUDGE QAZI fAIZ ESA asking me that in this review , same Notification can't be taken . 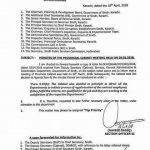 If I had avilable this copy in My ICA at Lahore , or my CP stage then I could have provided it , I requested bench to open http://www.mod.gov.pk and same post was still vacant in August 2015 . But instead of penalising the Deptt, they penalised me , by the way , I was made Overage , to whom I shall approach for the discrimination & Over age ? Dear Nazia still no updates and i think in near future there seems nothing. Dear Nazia still no news about new jobs. Ap k reply hopefull nhe it's mean fgei Waly hmary liya kuch nhe karin gy? Miss any news about hononary staff. Shamila g plz kuch ho ga b yae yae log just time pas krwa rahy hain ?wt is ur info about this? Dear Anaya Khan, I hope these will be regularized soon. Hope for the best. Justice Father Minallah gave a verdict in dacoit of Hon/ D-Wages employees shall be regularized within 3monthe by new cabinet subcommittee counsel for the petitioner Malik Arshad Umar and etc . decision was announced at 10am 11-9-14. Plz have any person has it's copy from IHC? No sana I don't have copy I saw in net and share with all. Plz any body know about this should shair them. plz tel me any news about the regulazation of honarary staff in fgei? Dear Sana, filhal yeh case in silent mood hay. Dear Nazia, I think there is nothing going to be happen in near future. Dear Nazia, filhal koi updates nahin hain. 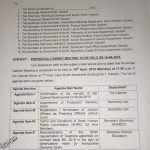 are there any chances of regularization of hon.teachers ... if you have any latest information please reply and guide us to whom should the hon.teachers contact ?????? Thanks ...!!!!! Dear Fehmeeda, still no latest updates in this regard. Dear Nazia still the case is in silence mood. No updates have been received. Can I appeal to the competent Authority for my promotion as LDC on the basis of Education and having 40 w.p.pm typing speed? Waiting for a positive and earlier response. Thanx in advance. Dear Atif you can join the departmental test for the promotion of LDC. km hoga k nahe?koe to honorary walo k bary main sochy. Dear Kashif Habib still no latest updates in this regard. Dear Sana, fil hal to koi updates nahin hain. Dear Rehman Ullah meray paas updates nahin hain is silsalay main.